Many of Ramadan’s cultural traditions have their roots in the Ottoman times. While there are traditions that date way back to the era of the Caliphates; most of the traditions we know today – and in various countries – came to light during the Ottoman times and have been often adapted and at times even slightly tweaked and thus continued to exist until modern times. Fasting, feasting, poetry, light displays, street performances, theatre, music, night celebrations lasting to dawn… are all characteristic of Ramadan in Ottoman times, and continue to be characteristic of Ramadan today. 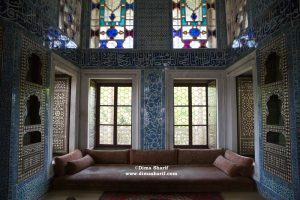 In this post I will explore the after Iftar activities that took place during Ottoman times. This is an exploration of Ramadan from the perspective of the public during the Ottoman era. I have also dedicated other posts for exploring the Ramadan traditions from the palace perspective, the janissaries as well as the Ramadan pantry during Ottoman times and the menus of the Sultan on the links at the end of this post. I trust this way, you will have received the full picture of Ramadan in Ottoman Times in case you were wondering. I have written these posts in hope to shed light on the origin of some of the Ramadan traditions, and what has become known as the “Ramadan Spirit”, or ‘the defining characteristics of the culture of Ramadan’. As Ramadan is today, in Ottoman times the Holy month was a festive time during which people dedicated their days to spirituality (fasting and praying), and their evenings to celebrating by enjoying the entertainments at various sites. 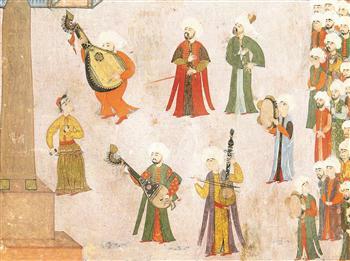 Ramadan during the Ottoman times combined religious worship with entertainment. While the days were quiet as people fasted, prayed and rested, the nights were crowded, vibrant and stretched till the break of dawn. Ramadan entertainment included music (mostly classical Ottoman music and religious Sufi music), Sufi Dervish performances (twirling dervishes), Karagöz performances (puppet shows also known as shadow plays), as well as illusion shows… talented people such as stilt performers, magicians, poets, and musicians among others, thrived as they would all perform in the streets of different areas where people hung out with their families after Iftar. The children would enjoy the performances too, and if people were pleased by the shows they would pay these performers, and would not if they found the show dull or uninteresting. Therefore, competitions between performers took place and enthusiastic crowds would decide who was a better performer. The performer with the most crowd will be known as the best and as the days went by will have acquire more fans consequently earning more. If Ramadan fell during spring, many moonlit boat trips were offered. These boats would travel up the Bosphorus aboard which live entertainment including music and songs were performed. As the Turks settled in Anatolia and carved out the Ottoman Empire, various types of music developed specifically among the urban ruling class (the palace in particular and its surrounds). Besides the ruling class, music also prospered in the mansions of the upper class. The classical Ottoman music tradition was based on two foundations: the elitist or divan literature, which mostly consisted of poetry, and the mystic orders of Islam in the 16th century. As there was no system of notation at that time (until the beginning of the 18th century), music was usually passed down from one master to another. Therefore, musicians learned the pieces by heart and passed them down only to their pupils. Fasil فاصل , is the best known form of the Ottoman classical music. In Turkish language the term Fasil literally means ‘section’ or ‘part’. The word is originally Arabic and when applied to music, it refers to the playing and singing of pieces in a specific order. The instruments used in a Fasil performance are generally the Saz (a string instrument) Ney (a reed flute) and Tanbur (tambourine with cymbals). Oud (a plucked lute with a short neck) as well as Qanun (a plucked zither) and Kemence (a bowed fiddle) are also instruments that are very commonly used in Fasil pieces. During Ottoman times, Fasil was the music of choice to play at Iftar. This had become a tradition performed in public places and at the mansions of the upper classes. During the Ottoman rule, Fasil music was adapted to Arabic lyrics and became also well known and performed in most Arab cities, especially in public places and eateries particularly during Iftar meals and Suhoor gatherings. Until this day, hotels, Ramadan tents and restaurants boast playing Fasil music as entertainment throughout Ramadan, a tradition that was born in Ottoman times and continued to exist today. Lighting and light displays were characteristic of Ramadan at that time and continue to be so today. Cities, streets and specifically mosques would be lit up in celebration. During the Tulip Era of the Ottoman Empire, the famous Tulip Gardens would hold torch-lit parties every night. These parties celebrate the beauty of the tulip gardens and offer a gathering place for people and performers in a beautiful surrounding. Besides the scattered lights everywhere, during these parties candles were secured on the backs of many turtles that were left to wander freely, lighting up the place and creating an ambiance for the people hanging out there. The most symbolic light feature of the Ottoman Ramadan was the Mahya illuminations, which were and continue to be the most characteristic aesthetic. Mahya illuminations are light displays, made from hundreds of tiny lamps hooked to ropes, strung between the mosque minarets, lighting up the night sky in a way to spell words of religious significance or to draw a picture. 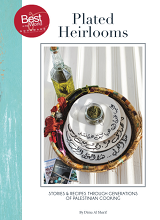 This custom was originally created to celebrate Ramadan and express thanks to God for joy, abundance and prosperity. It was also frequently used to encourage the populace to perform good deeds. Interestingly, before the advent of electricity, making the Mahya was obviously very complex and was performed only by very skilled and dedicated people. A Mahyaci (the person creating the Mahya) had to produce a different pattern everyday. The whole production takes place just after Iftar and has to be done by the end of Taraweeh prayers (Ramadan evening prayer). This is usually a period no longer than two hours, and at that time you are talking about ropes, olive oil lamps, hooks and ladders to connect this Mahya and then light the whole thing up in perfection! 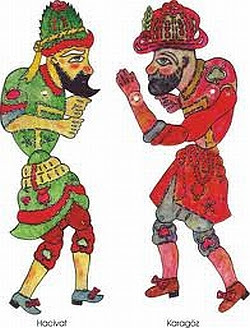 Further still, if Ramadan fell in winter, the mahyacı had to put up with the cold weather to display his skills, so it was a job performed only by the dedicated enthusiasts, and usually passed down from father to son. With that said, there was fierce rivalry between the various mahyacıs to produce the most impressive display. Every evening a new design was created and guarded as top secret. The crowds would begin to gather as the first lamps were put in place and would try to guess what the new concept was. Tradition has it that the illuminations during the first fifteen days of Ramadan should consist of words while those for the last fifteen days are of pictures. The writing was to be short consisting of max three words. For example phrases such as “Welcome Celebrated Ramadan”, “May God Protect” and “Alhamdu Lillah (Thanks be to Allah)” were commonly used phrases. It was only in 1911 that non-religious slogans such as “Hurrah (for Liberty)”, “Assist Orphans” and so on started to be displayed too. The pictures usually included motifs from Ottoman life, such as mosques, sail-boats, stars, roses, birds and crescents… etc. 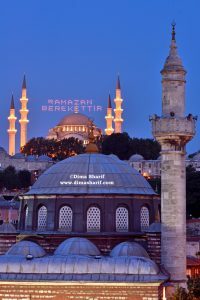 Mahya, has grown to become a famous tradition in various Turkish cities and other countries, however it remains characteristic of Ramadan in Istanbul. Similar light displays have become increasingly popular such as light phrases as well as the crescent and star picture, which are hung on balconies and in restaurants as part of decorating to celebrate Ramadan. It so happens that the Mahya illuminations are the base of all that! Thank you for the good writeup. This post amused and informed me.I look forward to more posts from you! from some of the information you provide here. Please let me know if this okay with you. as long as you credit and link back you can quote some information, however if you plan on referring to recipes and full articles, please link instead of quoting the full article.